As far as we can tell, as soon as two pieces of media were ever produced, somebody somewhere tried to put them together. The mashup is a tried and true art form and the internet is its canvas. The newest entertaining combination has brought together Age of Ultron with The Wizard of Oz and asks one simple question. What if the Tin Man lost his damn mind? The trailer parody Age of Tin Man is brought to us by Darren Wallace on YouTube. While a few Avengers characters get to remain themselves, the part of the Captain America is played by the Scarecrow and Thor is the Cowardly Lion. Black Window in the role of Dorothy seemed like a bit too easy in our opinion, until she dropped out of the Quinjet on her motorcycle, complete with a basket hanging on the handlebars which Toto drops into after her. It’s at that moment that the trailer becomes art. We didn’t realize the Avengers needed a sidekick dog until now. 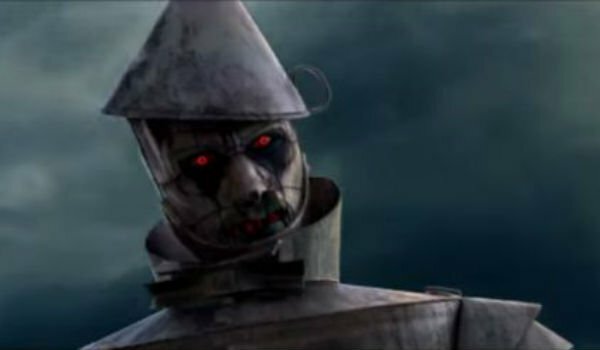 While most of the mashup is fairly simple, cutting images out of Oz and covering the faces of the Avengers, the work on Tin Man is much more detailed and impressive. Rather than just covering Ultron’s head he’s created a complete evil Tin Man, complete with ax, to take on our heroes. While the trailers final image might not be Hollywood blockbuster special effects level, it’s an absolutely solid creation. Something that would be at home in a SyFy channel movie, well other than the one called Tin Man. Whether it’s getting a glimpse of something we’d like to see but probably never will, or getting to witness something we had no idea we needed to see, the mashup has become a great way for budding internet artists to show creativity, but within the confines of familiar material, and in doing so create something entirely new. Using existing content can help bring the eyeballs of viewers who might not otherwise give the work a serious look. We all look forward to the next insane thing the internet will create. So go forth and nail together a couple things that have never been nailed together before and see what comes of it. We have our favorite mashups, and we’ve posted a lot of them here. Do you have a favorite? Is there one that we missed? Let us know.